The setting is New York and Terri Russo a detective for the NYPD is called to the scene of a murder where she discovers a sketch of the victim alongside the body. Russo is aided in her investigation by Nate Rodriguez, the police sketch artist. Nate’s father was an undercover narc for the NYPD, Nate still very much disturbed by his fathers death, has managed to avoid doing any on the scene police work. All this is about to change as Nate is drawn into the case, and maybe even further than he could have imagined. Nate begins piecing together the face of the killer and he himself then becomes a target. The killer also sketches people, his victims, and he uses his abilities to turn the investigation in a different direction. You will find this story erupts with some explosive twists, so hold on for a heart pounding ride. Jonathan Santlofer is also an artist and has his works displayed in several locations including museums. He received his Masters of Fine Arts from Pratt Institute. Santlofer began writing in 1989 after a gallery fire claimed five years of his works. Anatomy of Fear contains both of his talents; his artwork enhances the strong compelling and intriguing plot, each complementing the other. 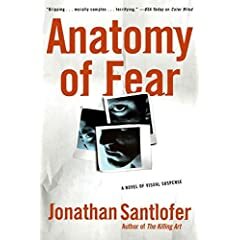 Santlofer has a steady flow of action and suspense with enough twists and turns to leave you with anticipation. The characters are distinctive and interesting with qualities that make them believable. The scenes are written with such a compelling impact that is gripping and makes this a genuine page turner to the end. A guaranteed 5 star read.